Pantages Theater, formerly known as RKO Pantages Theatre, has a history which is majestic and varied. Movie enthusiasts have flocked here to enjoy countless shows over the years. The theatre is one of most popular theatres in the United States. It was built in 1930 by a Greek immigrant, Alexander Pantages on Hollywood Boulevard close to the corner of Hollywood & Vine. This was the last theatre to bear his name. Architect Marcus Priteca designed an art deco structure, giving way to the ornate box office area as well as an opulent interior. Constructed around an art deco theme, the theatre was always regarded one of the more elegant theatres in Hollywood. The structure has distinctive features and it is a lovely architectural marvel. The building was refurbished in preparation for the filming of “The Lion King.” This refurbishment brought it back to its appearance. Inside the theatre, a 54 foot proscenium is bounded by 2,691 seats under a sophisticated geometric star-domed ceiling. 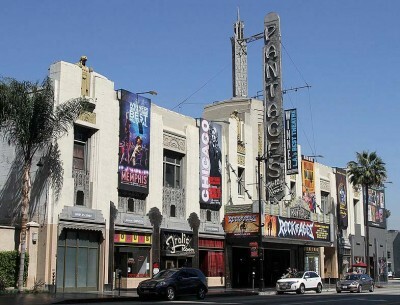 There are lots of movies that have been filmed at the Pantages Theatre. “The Bodyguard” was partly shot inside the theatre. Also, it has hosted stage performances of “Phantom of the Opera,” “River Dance” as well as “Annie”. The theatre is also renowned for staging a musical version of Disney’s classic “The Lion King.” The show was declared a roaring achievement, bringing in millions of dollars on the first day. Since it was established, the theatre has been a place where lots of popular films have premiered. This has given it an extra prestige. A visit to the theatre is a rite of passage for most Hollywood enthusiasts. Classy art deco architecture adds to the appeal of the theatre. The theatre is open to the public year round. However, cameras inside the theatre are prohibited. Drinks and food are also prohibited, unless you’re bringing in water and snacks from theatre premises.